On Tuesday (10/27/09) I was driving back from Laney College up to my home in Albany. A ways in advance of where 880 splits off for (I guess) 80E and 80W (Bay Bridge) I realized we were merging out of the left lanes for the Bay Bridge- with flares and cones. No Caltrans trucks, flashing arrow signs, hundreds of cones, just a smattering of flares and dingy cones. And then headlights, coming toward me out of those lanes- wait?? huh? They had apparently rerouted traffic “out the in ramp”. I’m still not sure exactly how it worked- but by the time we got to the Y it was quite clear that something funny was going on with the bridge. Then over the flyover I could see the “parking lot” in the toll plaza everyone has been talking about. 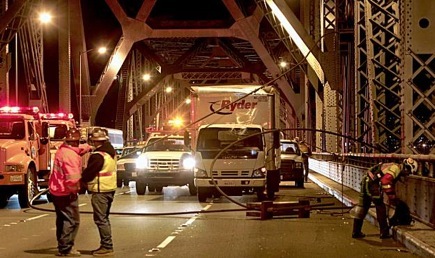 When I checked 511.org and sfgate.com at home I learned that the “saddles and rods” fix that the contractor CC Myers had installed on a cracked “eyebar” beam on the bridge had come apart, smashing a couple cars, and the bridge had been shut down indefinitely. The cracked eyebar had been found during Labor Day’s planned festivities- the replacing of the approach to Yerba Buena island with a temporary section to allow construction of the new bridge approach- and the weekend closure was extended another day to set up a reinforcement for the cracked beam. The contractor finished up a half-day early to the lauding of the general bridge-going population, and the bonus-granting of the local governments. The apparatus they devised lasted seven weeks before high winds on Tuesday caused one of the four long rods under tension holding the parts of the reinforcement together to snap. The forces in the assembly were then became unbalanced and the rest of it pulled itself apart, flinging massive hunks of steel across the roadway. The immediate response has been one of annoyance over the closure of the bridge, hope for it to open again soon, general sympathy for the situation. It’s been treated sort of as a natural disaster, something unexpectable that couldn’t be averted, and now must be taken care of. Sfgate.com published this editorial that captures some of my feeling about the whole matter, the fundamental “High winds should be anticipated on a bridge” idea. There has been other publicity of the possible half assed-ness of the “band aid fix” like here, and this editorial blathers a bit about Caltrans and the Chinese steel and “adulterated” concrete that has been used in the footings for the new bridge. Maybe “this country needs an ethics revolution”, but the problems here lie in engineering integrity, not solely in material quality or governmental dishonesty. But in general, the public and media response to this has, in my view, given the people responsible a bit of an easy time. Once you find something like the cracked eyebar on the bridge you can’t pretend it doesn’t exist and do nothing about it. Even though the bridge still is intact, and was showing no signs of coming apart destructively. Once something like that is known, it must be fixed. But in critical situations, the quality of the fix must not be affected by the perceived importance (or lack thereof) of the problem it’s fixing. Is it possible the engineers in charge of designing the “bay bridge band-aid” realized that the bridge wouldn’t come apart if the eyebar snapped and therefore weren’t very careful about the design of the fix? Did they say well, it’s really not going to break, and even if it did, people probably wouldn’t die, and the bridge is going to be demolished in a few years anyways, so we’ll put together this simple thing that will take the static tension load of the eyebar and forget about it? Not taking into account that the thing they slapped together was in fact just as much a part of the bridge as the rest of the bridge once it was installed on the bridge and just as likely to be subjected to the adverse conditions often found on the bridge, and in just as much a position to injure people in its own failing? Would they have designed this part differently if the eyebar weren’t cracked, but was gone and their fix would actually, for sure have to bear the load of the beam it replaced? It doesn’t take an engineer to see that high winds should be part of the assumed conditions in designing a part for a bridge, just like salty spray, dynamic loads from passing cars and whatever structural role the part fulfills. I think it’s pretty telling that the “band aid” whipped up in a few day’s time to “take care of” the cracked eyebar problem was the only thing that failed. That it destroyed itself, and in destruction posed as a potentially fatal hazard to people driving on the bridge. Truly an example of bad, bad engineering. Like, the bridge was designed so that if an eyebar failed, the bridge would not fall apart. This “fix” that was installed was designed in such a way that when one part of it failed, the whole thing explosively came apart. Right. I think it’s hard to argue that that couldn’t have been foreseen, or was unavoidable. An analogy: If a drug company wants to make a drug to help people grow bushier eyelashes (which they HAVE, another WTF for another day) it’s morally not OK for that drug to cause cancer and death in 1% of the population. It’s not OK to put out a drug that has a chance of really hurting people under natural, “foreseeable-for” conditions. Bridges rarely fail. Nor do jet planes, or high speed trains, or even cars fail dangerously under a wide range of natural operating conditions. That’s due to the complex, slow moving, expensive process that has evolved for designing stuff that doesn’t fail catastrophically. There are protocols and known things to take into account when you’re building a bridge, or anything else. When you get a blitz engineering job that generates a failure like we saw on Tuesday, it shows that that everything that needed to be taken into account wasn’t. There’s a place for designing stuff that pretty much works, not all engineering has to be perfect. Stuff you build for yourself, or stuff that will not see a lot of abuse and isn’t in a position to hurt people can be designed with less engineering skill and thoroughness. I’m pretty familiar with making “good enough” stuff myself. But when you start selling a product that people rely on, or designing something that is as critical as a part for a bridge, there’s no excuse for inadequate engineering. If anyone knew that the fix was going to fail, that intensifies the practically criminal nature of this engineering oversight. Back when BART was brand new the train tracking system would periodically lose track of trains as they traveled around autonomously on their routes. They weren’t willing to acknowledge the problem or take any steps to remedy it. It took the constant hassling and publicity efforts of a third party group to get BART to fix the problem, which could easily have led to a disastrous accident. Making an engineering mistake in life-critical systems is unforgivable, it should never happen. People have been building these sorts of things long enough to know what needs to be designed for. Leaving a known dangerous piece of engineering in place while the critical system it is a part of is in service is downright criminal. Knowledgeably endangering people. I am very glad and, in hindsight relieved that no one was killed by this mistake. I only wish that people were more aware of how this should have been foreseen, that there were people who should have kept this from happening, endangering lives and now, with this bridge closure, putting many people at risk of losing their jobs.